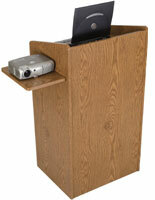 This school podium is a perfect solution for presentation slideshows or for customizing logos for your institution. 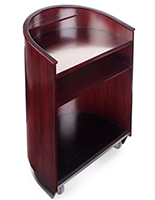 Designed with a sleek curved shape, this teacher lectern has a contemporary look for a variety of venues. This school podium is furnished with breakthrough technology; a 15" LCD screen with black wood frame built into the front of the lectern. The screen has the ability to display images uploaded with an SD-card or flash drive. 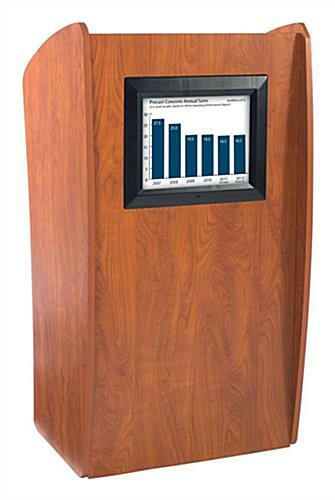 This school podium includes a remote control, allowing the presenter to switch to various preloaded images with a touch of a button during a presentation or between speeches. Speakers can also set timed image display intervals and include image transitions. This school podium is an ideal choice for a business that regularly conducts meetings with Power Point presentations and other visual aids. 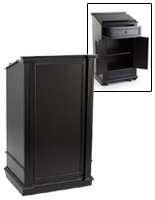 This multi-media lectern is like getting two components for the price of one. 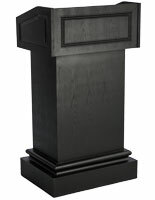 This school podium can be used to display customized logos for schools, hotels or places of worship. The media player can be used to display the theme for the lesson of the day, or to announce an upcoming church event. This school podium enables a speaker to bring a presentation to life by displaying diagrams and photos for the audience. 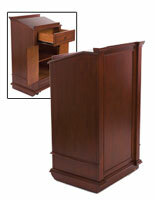 This hand crafted pulpit is built with a 3/4" stain and scratch resistant thermofused laminate on MDF. A thermowrap finish is achieved through a process called thermo-laminating. The single laminate piece is sealed all around the pre-made panels through vacuum, pressure & heat creating a strong bond and eliminating the need for edge banding. 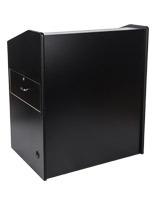 The rear area of this school podium features ample space to store other electronic equipment or supplies needed during a speech or presentation. 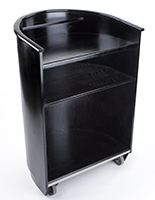 There are hidden casters on this lectern to allow for easy maneuvering and relocating whenever necessary. 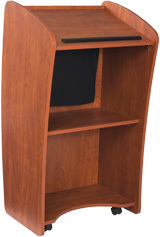 This school podium can be easily moved from room to room by one person. No need for assistance from another person, or heavy duty power jacks or lifting equipment. 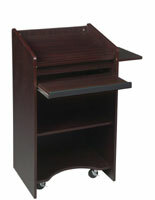 This school podium, a quality lectern has an AC power cord included. This wood lectern ships unassembled. 18.0" x 46.0" x 21.0"